Fiji Romance Guide - A couples fiji romantic guide for $2,000 a day! Are you a couple going to Fiji on a budget? 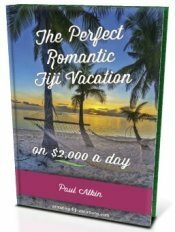 Discover how to have the perfect romantic getaway in Fiji on $2,000 a day, by using this romantic Fiji vacation guide. You get to discover some of Fiji's most stunningly luxurious adults-only resorts with a budget of $2,000 a day. I have carefully chosen 4 gorgeously secluded resorts that is absolutely world class and has some of the highest ratings in all of Fiji (according to TripAdvisor). All but the very most luxurious resorts are within your reach with this budget. Each of the 4 options has a step-by-step cost breakdown for your entire stay in Fiji. The Luxury Lover's Edition - "The Perfect Romantic Fiji Vacation... on $2,000 a day!" A 28-page special e-guide taking you step by step showcasing 4 stunning resorts & packages for a budget of $2,000 a day. This "The Perfect Romantic Fiji Vacation, on $2,000 a day!" e-guide belongs to "The Romantic E-guide" series which has guides for budgets ranging from $250 to $5,000 a day per couple. Visit our hub Fiji Vacation Guides page to check the others out.